Find out what happened when the rope swing broke, who painted the goldfish blue, and what drives parents bonkers in this humorous collection of verse. - Publisher This is another collection of hilarious verse for children from popular poet Paul Cookson. It features many of the ups and downs of the child's life, both in and out of school, with plenty for every 7-9 year old to identify with and enjoy. 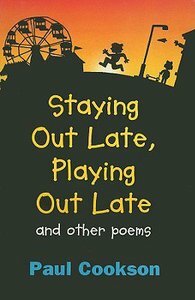 About "Staying Out Late, Playing Out Late"
This is another collection of hilarious verse for children from popular poet Paul Cookson. It features many of the ups and downs of the child's life, both in and out of school, with plenty for every 7-9 year old to identify with and enjoy. Paul Cookson spends most of his time visiting schools, performing his poetry and helping children to write their own poems. Paul has compiled lots of books for Macmillan (over 500,000 copies sold to date), including The Works, and has two collections of his own poetry. He supports Everton, and lives in Nottinghamshire with his wife and children.